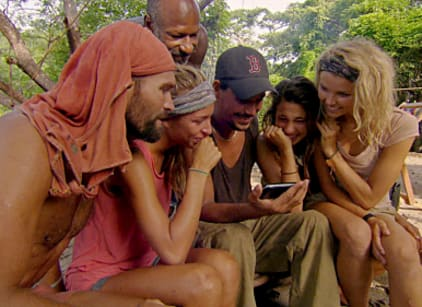 The ten remaining castaways (six Murlonio members and four people on Redemption Island) receive a message from their loved ones on a cell phone. The four players at Redemption Island and the six Murlonio watching learn that the winner of the duel will get to spend time with their loved one. The loser of the four man challenge will officially be eliminated and sent to the jury. For the challenge, Matt, Mike, Ralph and Steve have to toss a ball to break four tiles of increasing distance away from them. Mike goes four for four with his throws and easily out paces the other three to win the challenge. Matt and Ralph benefit from terrible throwing from Steve to stay alive in the game. Before Mike is allowed to see his mother he is presented with the option of giving up his time so that Matt and Ralph could spend time with their loved ones or doing the same so that the six Murlonio tribe members can see their loved ones as well. Citing a verse in the bible which says that one must love his brother as much as he loves himself, Mike feels that giving up his time with his mother for the Murlonio members is the best decision. After a wonderful day with their loved ones, the Murlonio tribe has their first immunity challenge without an ex-Zapatera present. The very difficult challenge has the remaining six collecting three bundles of planks to fit on ascending steps. Going in order with just one board at a time, the first player to the top wins immunity. The challenge quickly reduces to a race between Andrea, Grant and Boston Rob. Each is within less than one board of each other, but Boston Rob makes the fewest mistakes to take a slim lead. His lead is jeopardy as he bakes under the 110 degree sun, but Boston Rob fights dehydration and cramping to finish just barely ahead of Grant and win immunity. Back at camp, the tribe seems to be in agreement that Andrea needs to be sent home because of how much of a threat she is and her pre-existing relationship with Matt, who’s still a threat to come back to the game. However, Phillip does his best to muddy the waters by getting on everyone’s skin. This causes Boston Rob to take a moment to reconsider voting for Andrea, but ultimately the tribe goes with their original plans. Stunned, Andrea is sent to Redemption Island.